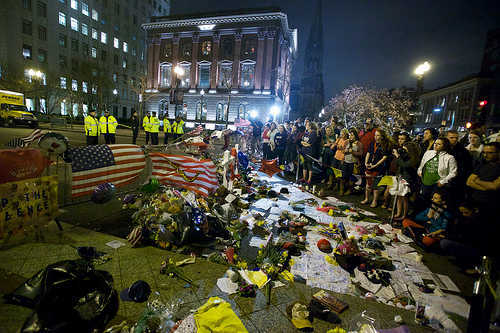 Recent horrifying act of terror in Boston sadly overtook the ongoing Boston marathon and Commonwealth’s celebration of Patriots’ Day. Public and the media exhibited the mixed reaction giving a lot of opportunity to observe the behaviour of the media which was rather interesting. Almost all the major news channels on the TV started their propaganda against the foreigners or possible Islamist act of terror. People gathered coming out on the streets and chanted, “USA! USA! 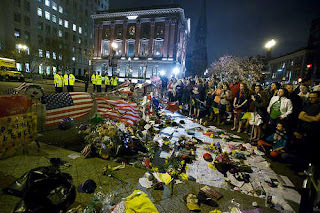 USA!” which is very obvious, of course people were angry. This is something which Americans rarely see, and any such activity disturbs the people a lot more than in Middle East and South Asia, where America has been acting like that. It is not about which act of terror is more horrifying, it is not about which lives, whether American or Asian, is more costlier. It is about how do we react after such a censurable occurrence. Irresponsible journalists almost on every news media channel used racial profiling and anti foreigners, xenophobic language. Sidelining those foreigners who form a large part of American population, not just that, they form a large part of American economy, be it an Indian, Chinese, or a Middle Eastern. Sometimes I feel, India, which has been the victim of terrorism since as long as 1989 when rest of the world hadn’t even heard of terrorism’s new radicalised form, handled the situation like these in a more matured manner. Cross border terrorists coming from Pakistan who attacked on Indian Parliament and India’s financial capital of Mumbai in 2011 in the name of Islam could have initiated a full fledged war between the two countries. However India’s strong diplomacy prevented further killing of people, without harming the sentiments of the Islamic population of India which is nearly as much as Muslims in Pakistan. The attitude expressed by the media either deliberately or unintentionally will do more harm than good by dividing the people in USA as foreigners and non foreigners breaking the very nature of the principles upon which it was founded. It reminds me of the incidence occurred in 1901, when a 28 years old American citizen named Leon Czolgosz assassinated US President William McKinley. It was later found out that he held a Polish (of Poland) background. After the unfortunate death of the President, then American media went on a full fledged blaming round against Polish immigrants. They called them outsiders, Catholics and people with strange last names. After it was revealed that the Boston bombing suspect brothers are of Chechen descent, whole American media waged a propaganda against Chechnya. Even when there was no evidence of the brothers involved in the unrest movement which went on in the southern republic of Russia. The two brothers never lived in Chechnya, although they spent a part of their lives in Dagestan which is a larger neighbouring republic of Chechnya. The older brother, Tamerlan, was born in Russia and moved to the US when he was sixteen. The younger brother, Dzokhar, was born in Kyrgyzstan, he moved to the US when he was nine and last year in 2012 he became a US citizen. Just because they were Caucasian, US media was too keen to relate them with the Islamic unrest in the Republic of Chechnya in Russia. The Daily News interestingly questioned ‘Did Boston carnage have its roots in Stalin’s ruthless displacement of Muslims from Chechnya decades ago?‘ Similarly, National Post questioned in its article ‘How did Chechnya’s culture of terror come to Boston?‘ The Washington Post published its opinion and analyses really quickly and even discussed how the two bloody Chechen wars caused incredible damage on their lives and radicalised them to conduct Boston blasts. Chechen movement’s main motive was for the creation of an independent state out of Russia. Their main enemy has been Russian government, then why would they go and attack in America. If they had gone to USA to gather support to fight against Russia, I would have agreed to the Chechen connection. It is true that Chechen movement has grown from just demanding independent Chechnya to a creation of a pan Islamic Caucasian state that includes much of the Muslim majority northern Caucasus region of Russia, but still their main enemy is Russia. The movement is more Anti Russia than pro Islamic. The two brothers spent most of their life in US, done their education their and lived life much like other Americans, but the media stripped their American identity, American lifestyle and associated them to a land really far and back in time when the movement was on its peak. Western media is stuck at the time when Chechnya movement was on its peak. They deliberately tried to miss the Chechnya of today which is a fast growing region, enjoying much greater security and economic stability. The article is not to show sympathy towards the brother, what they did should be condemned, but the way American media responded is really an immature behaviour. There are normal people in Chechnya too, not every can be associated to the movement. This generalization will do more harm than good to America which is a society made of immigrants, where most of the economy is run by them. Throughout all these years, US showed their sympathy towards the Caucasian region. But with this attack US establishment has turned an aggressive stance against Chechnya. To me all this drama points to the notion which America wants to prove that no insider could have done this job and only a foreigner could do. 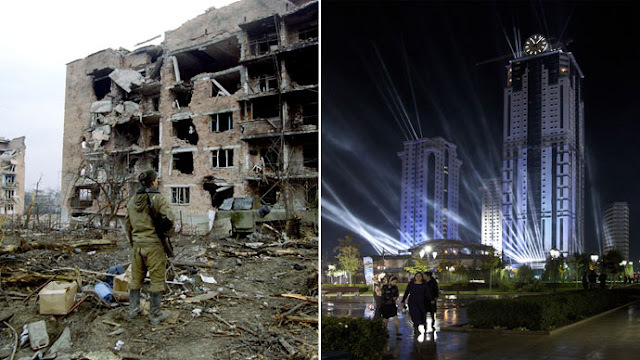 Thus, to clean their image U.S targeted Chechnya.